The root canal system is complex enough to perplex, challenge and sometimes frustrate even the best of clinicians. There can be no doubt today that microorganisms, either remaining in the root canal space after treatment or re-colonizing the filled canal system, are the main cause of endodontic failure. 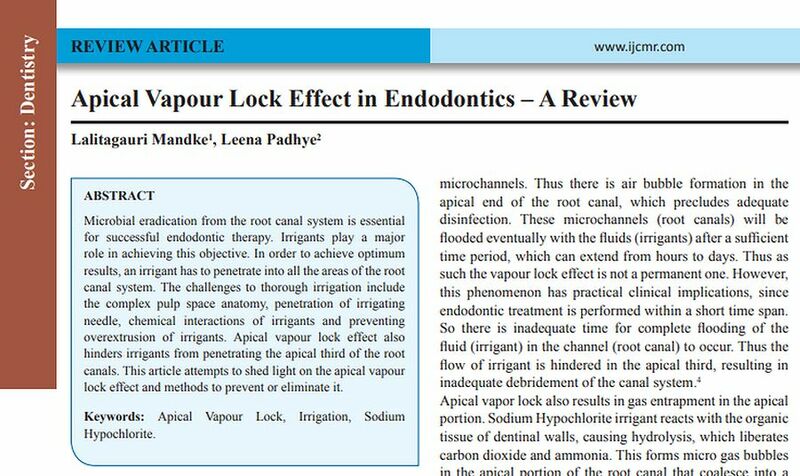 The importance of irrigation in endodontics cannot be overemphasized, as an irrigant can touch areas in the root canal that an endodontic instrument cannot. The term ‘excessive irrigation’ does not exist in endodontic parlance. There is an overall consensus that volume of irrigant is the most important criteria during irrigation. In fact, Schilder in 1974 advocated an average of 39 ml of NaOCl per visit, to clean the root canal space. Schilder’s irrigation protocol became the benchmark of excellent clinical treatment. It is critically important to develop an irrigation protocol wherein the irrigant penetrates into all areas of the root canal, including the apical ramifications, isthmi, fins and deltas. It is easier said than done. 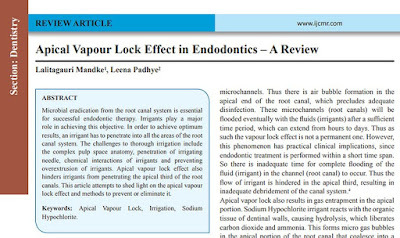 Apical vapour lock effect is one such major hindrance in achieving this objective.